We can all agree that learning to swim is a pretty important skill for our children to have – especially in Australia. But what do you do when your child refuses to take part in swimming lessons? A Babyology mum posted this exact question to our Facebook page and the support and advice she received in response was incredible. US Olympic swimmer Michael Phelps recently shared his seven-month-old son Boomer’s introduction to the pool to show it is never too early to build our little ones’ confidence in the water. While Boomer let out a grizzle and had a tight grip on his dad at first, by the end of the lesson he peacefully snoozed and enjoyed the dip. Unfortunately, this is not the norm for all parents. A worried mum anonymously explained to the Babyology community the ordeal she faces every time she attempts to take her 16-month-old daughter for a swimming lesson. “My 16-month-old daughter hates her swimming lessons so much, I don’t know what to do,” she wrote. “We can’t even get her in the water after five weeks of weekly attendance – she screams, cries and tries to escape the pool area. “It doesn’t matter if it’s me or her dad getting in with her, she just won’t have it. “Offers of rewards haven’t helped at all. It is so upsetting, I just can’t put her through it anymore. “Our instructor said she’s so distraught that we should wait until next year and try again so we don’t put her off the water forever. The Babyology community were quick to respond, with many parents explaining they were facing the same battle with their own children. One mum says her six-year-old stepson is just as reluctant. “We don’t know what to do. He will happily stand in a pool just above his waist but won’t dunk down. Even being held by an adult in a deep pool, he screams and clings like a baby,” she writes. Another mother shared that she found hitting pause on swimming lessons for a time worked for her little boy. “My son did this when we tried lessons. He flat out refused to get in. So upset. Just wasn’t ready. “We decided not to push and just have fun at the pool. We took him swimming to play and enjoy and get familiar with the water. “At four-years-old we tried again and he was great! [He] is now in the same level lessons as the majority of kids in his year and loves swimming. While another mum says that perseverance was the key for her little girl. “Both my kids screamed for months – my two-year-old pretty much screamed for a year straight, we changed swimming teachers and she is now happy, confident and runs and jumps into her teacher’s arms,” she writes. 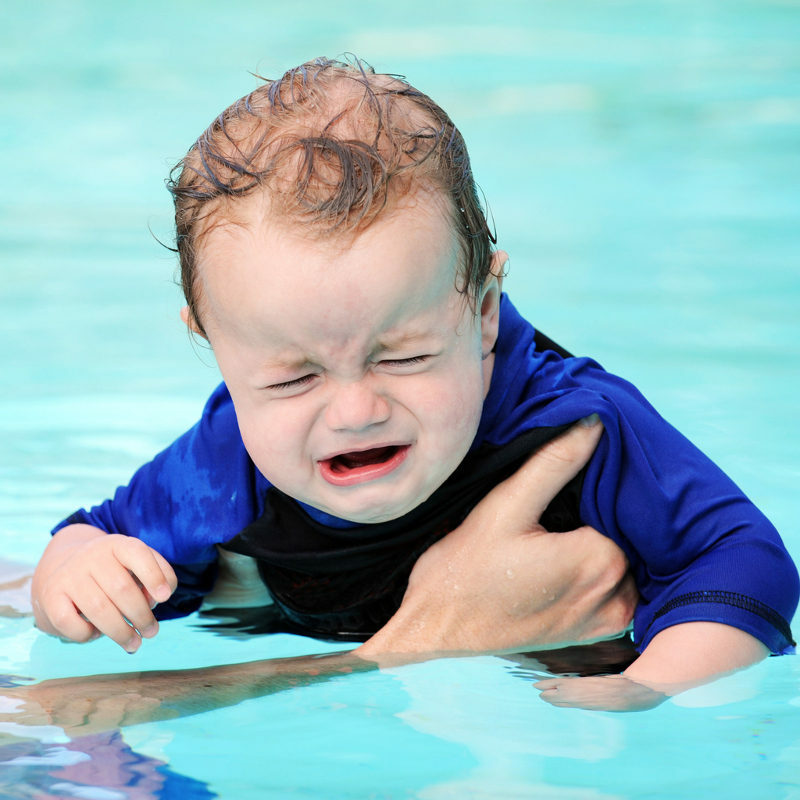 Babyology spoke to swim teacher Jacquie Rodney from Aynsleys Aquatics Swim School in Richmond NSW who advises parents not to put off swim lessons, no matter how painful it becomes. “I would definitely recommend this mum persevere,” Jacquie says. “I would find a swim school where her daughter feels most comfortable and where her parents feel most supported. Always talk positively about swimming and water, never have any negative conversations. “Just try and build a positive rapport with swimming,” Jacquie says. “It can be hard and it is horrible to see your child kick and scream and not enjoy it, but eventually they definitely come around. Jacquie says it may take time but eventually children come around. Jacquie says a supportive swim school will listen to parents’ concerns and past experiences and can offer advice, support and understanding. “Swim schools can give you information on activities you can do at home so they can associate any sort of water orientation or familiarisation at swimming,” Jacquie says. Jacquie says swim schools should never turn people away, they should always encourage students and help empower parents. Like anything, if it isn’t fun, children won’t want to do it. “Any time in the water is good, the more practice, the more playing, the more fun, the better,” Jacquie says. Jacquie says giving up can send the wrong message to a child. “The moment you relent, children learn they can get out of it,” she says. Just as you would persist to get a child into a car seat, Jacquie says parents need to persist with encouraging their child to learn to swim. “It is a lifesaving skill they are learning and it is really important to persevere,” Jacquie says.